Dataedo enables you to create and add to your documentation multiple diagrams simply by dragging & dropping tables from your database and choosing which columns you want to show. 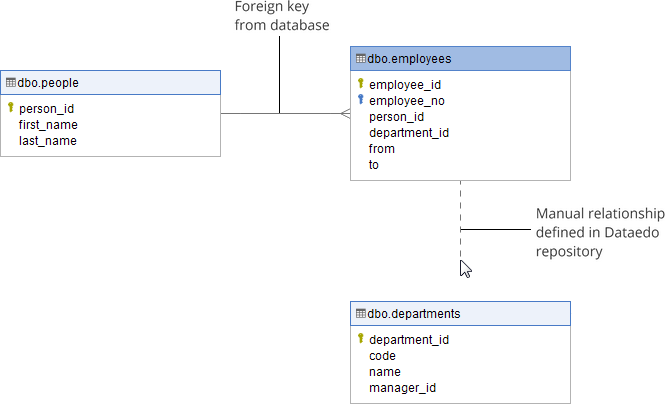 Table relationships are read from database foreign keys and added to diagrams automatically. You also have an option to add relationships not defined in the database completing data model documentation. What makes Dataedo unique and powerful is the ability to draw cross-database diagrams. You can even mix data from different platforms. Datedo keeps one consistent metadata model for entire documentation - data dictionary and ER diagrams. Whenever database schema changes you can easily import changes to Dataedo repository and apply changes in your diagrams. Dataedo lets you hide complexity of data models by ability to create multiple diagrams per database and show just key columns, the one that tell the story. You can include both tables and views in your diagrams and define relationships between them.